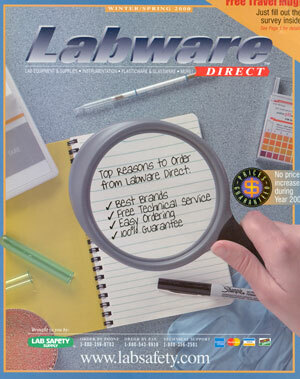 The Labware Direct catalog features products for use in a variety of laboratory settings. The catalog includes lab supplies, instruments and sampling, safety equipment, training and identification materials, and assorted plasticware and glassware products. Many manufacturers and brands are represented in the catalog, and it also offers easy ordering and free technical service. Lab Safety Supply Inc.,(Division Of W.W. Granger), PO Box 1368, Janesville, WI 53547-1368. Tel: 800-356-0783; Fax: 800-543-9910.